There is more information available on this subject at Door on the English Wikipedia. A common type of Forerunner door. Doors are movable barriers used to cover up openings; typically, such barriers are attached to the very openings they block. Doors are a basic component of architecture among all known major civilizations. Like all technology created by the various organizations and civilizations that have existed throughout history, the doors they create are typically representative of their overall design styles and aesthetic preferences. The Covenant frequently use curves as well as bright purples, blues, and grays in the design of their technology; everything from weapons to cities. The doors incorporate the curves and colors standard to Covenant design, most notably in High Charity. While many Covenant doors have indicator lights and work by sliding in and out of the walls, the doors in High Charity also flash and emit a tone when approached. Human technology for doors has progressed over the past centuries. While most doors in the past have been based on a hinge system, the doors seen on Earth and equally-developed off-world colonies are almost exclusively sliding (except for the antiquated doors in Crow's Nest), either opened by proximity or a switch located on the door itself. Like most human technology applied to everything from roads to spacefaring military vessels, the design is simple and geometric (with some discrepancies) with straight lines and angles, and involves blacks, grays, and browns. Most doors have a light on them that is either green to indicate that it is open or can be opened, or red to indicate that it is locked. While human doors usually consist of one or two sliding segments, there are some exceptions, such as the multi-segmented doors in some of Reach's industrial facilities. Reinforced blast doors are a common sight in military bases and starships, but are also used in cities, such as New Mombasa, to close off certain sections in emergencies. 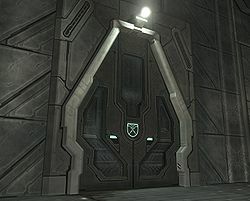 Doors built by the Forerunners are completely geometric and incorporate the similar light grays, browns, and blues of the rest of their technology. The doors themselves are geometric and often slide in multiple parts. They also have complex and geometric designs on them, it is often patterned. This same trend can be seen on floors of Forerunner structures. While the Flood do not have what we consider conventional architecture, they build their structures out of biomass they have consumed, adding to the disturbing overall impression of their hives being living things unto themselves. Flood doors, called Portas, are built from biomass of infected hosts, and resemble valves like those in the heart. They open based on proximity. While the sections of the door itself retract, the circular frame of the door contracts at the same time. The object John-117 rode to Earth in the beginning of Halo 3 appears to be a Forerunner door from the Forerunner Dreadnought. A Forerunner door on Installation 04 in Halo: Combat Evolved. A Forerunner door in Halo: Combat Evolved Anniversary. A closed Forerunner door on the Threshold gas mine in Halo 2. A Forerunner door opening on the gas mine in Halo 2. A door in one of Installation 05's older structures. Another door on Delta Halo. A multi-segmented door within Delta Halo's Quarantine Zone. Another, single-segment door within the Quarantine Zone. A Forerunner door on Installation 08. One set of bulkhead doors on the UNSC Pillar of Autumn. Another set of bulkhead doors on the UNSC Pillar of Autumn. A door in Crow's Nest. A gate leading out of Crow's Nest. A door in Traxus Factory Complex 09. A door in High Charity. A smaller Covenant door in High Charity's High Council Chamber. A Covenant door onboard a CAS-class assault carrier in Halo Legends: The Package. A set of blast doors on Cairo Station. A door in a BXR Industries mining facility on Reach. A Flood Porta in Halo 3. UNSC door control switch in Halo 4. A set of blast doors on Cairo Station in Halo 2: Anniversary.